Jan 2019, Gurgaon, India. 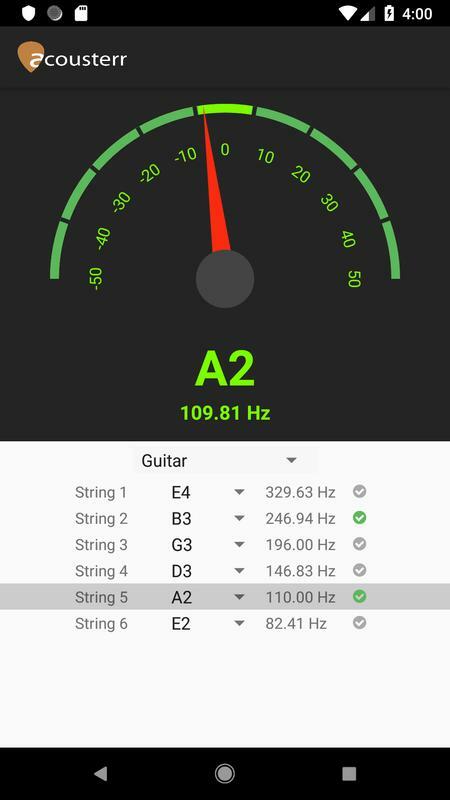 Acousterr, an innovative online platform for music learners, has expanded its domain by developing an android app of guitar tuner named ACOUSTERR GUITAR TUNER, Its an android version of the popular ACOUSTERR ONLINE GUITAR TUNER. - Supports customized tuning - easily change tuning of any string. - Supports ukulele, bass guitar, mandolin - all in one single application. - Shows you which all strings are already tuned and which all are pending. Acousterr guitar tuner which supports ukulele, bass guitar, mandolin has drawn overwhelming response from music enthusiasts .Within days of its launch .it has been downloaded by above 5000 of guitarists .It offers a more modern approach by displaying the frequency measured and the frequency required. Elaborating on how it works , the developers explained that Acousterr guitar tuner takes your microphone input and shows a meter to help you tune your instrument correctly. To tune the guitar, play an open note on a single string and let it ring until it registers on the tuner. if the frequency the guitar tuner records match the fixed frequency for that note, that means that the note is in tune.The developers are optimistic & assured that it would make a guitarist’s life easier. Chromatic tuner would benefit music enthusiasts, both beginners who need to practice tuning his guitar as it will have a great impact on his playing as well as advanced learners who need to take care of every detail when it comes to their performance .IOS version of guitar tuner is in making & will be launched soon.